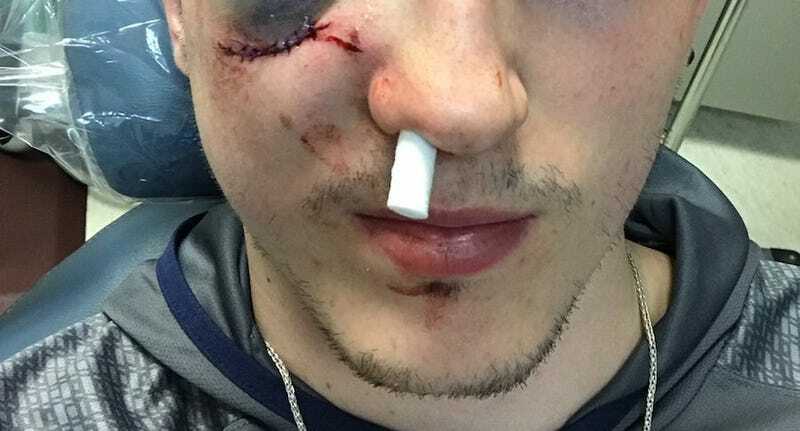 In the second period of Sunday’s Game 3 between the Penguins and Blue Jackets, Columbus defenseman Zach Werenski took a Phil Kessel shot right under the eye. Since Pittsburgh kept possession of the puck, officials didn’t stop play, which led to Bryan Rust tying the game at three as Werenski spilled red on the ice on his way to the locker room. The 19-year-old returned to the game in the third period with a full shield, but couldn’t make it to overtime because his eye had swelled completely shut. Werenski ended the Blue Jackets’ 5-4 overtime loss with 19:08 of ice time.